Round 13 could well prove to be a season-defining week, as teams were hit with injury, pending suspensions, rested rucks and a lack of Pies. I’m back with my Bullets, and I take a look at a Renewed Rivalry, the Makers and a real ‘Breakers’, and a wrap of the weekend fantasy action. Get on it! Before I get into it, a massive thanks to Amanda, who took the Bullets vehicle for a spin last week and brought it back in great nick, with a bit of extra fuel in the tank! Team FLOSSY obviously responded well to her public criticism last week, and pulled together a great victory over Calvin, who has been right up there in the last few weeks after his slow start to the season. Hopefully she backs up with a shocker, because the FLOSSY’s and Tbetta Than You go head-to-head this week! Emotionally, I’m all over the place this weekend. I’m happy about my trades, angry about my vests, disappointed with my guns, impressed with my Captain, blasé about my lost matchups, apprehensive of the tribunal and downright terrified with what Thursday’s Teams will bring. Hopefully, that sums up Dreamteam for Round 13. I can’t decide what mood I’m in with my team and it’s prospects, so I’m going to compartmentalise. Let’s start off with Optimistic tbetta. The good news is that a lot of crap things occurred this week, so if you had a shocker, chances are your opponent or those ranked near you did too. Also, with all the injuries mounting on teams, we should see a few more timely debuts – most notably Ian Callinan, who apparently chopped in the SANFL this weekend. And I guess with a lot of average scores from a few guns lately, prices will be right down and there should be bargains galore. But Pessimistic tbetta has a retort for everything. Like, why did the few remaining premiums left on our fields have to choose this week to go missing? We were already short half of our midfields! And why do the injuries all have to come at once – surely you can spread them out a little? Yes, sure there might be a few rookies on the way through, but what will the quality be like? JS would have to be next to non-existent for most of the fresh meat arriving from now on. And who cares if there are a lot of bargains, if most of them are players that I already own! I have a feeling I will be a lot more of the latter, given the news that the tribunal will probably bring. Anyway, let’s take a look at a few things from the weekend I noticed. A fairly clever heading there I must say… Anyway, Boyd was the one who let us down this week, only managing 70 points. He was tagged by Doughty who took over in Reilly’s absence, and he obviously did a great job, keeping Boyd to a season low and his lowest tally since Round 16, 2008. I would suggest it’s just a blip on the radar – he’s been in great form otherwise, and is still one of the premier midfielders, nay, players, in Dreamteam. Round 14 looks like it will be the return of one of the greatest rivalries – Team Swan vs Team Ablett! 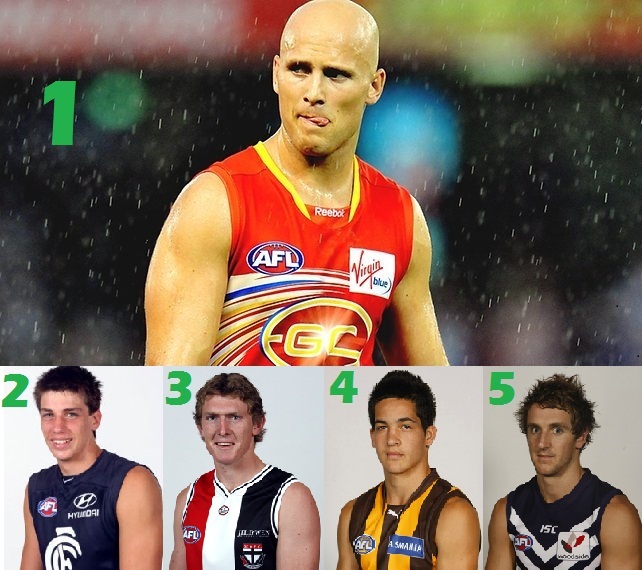 With Swan returning (hopefully) fit again and Ablett also fit and in great touch, it’s shaping as one of the bigger choices we will have to make each week – which one do we give the C to? Swan was averaging competition highs over the start of the year until he sustained that niggling thigh injury. And Ablett has finally hit his straps – since Round 7 he has scored 156, 92, 132, 146 and 135. That’s a 5 Round average of 132.2, the highest in the league. Compare that to Swan’s first 5, in which his average was 130 per match – we may just have the great rivalry back! Some huge scores this week, let’s check out the top 5. I’ve already talked about Gablett, but I’m going to indulge and mention him again here, where he thoroughly deserves to be. He was the only Sun to top the ton, and it was 135, and it was against Hawthorn, and in Launceston. Enough said. It was only Kreuzer’s second game back, but that didn’t stop him from amassing 133 DT points in a BOG performance, against one of the best 1-2 ruck combo in the league. With Sandilands out and Zmith listed as an ankle injury (although I highly doubt it was significant if it existed at all), Kreuzer could be a great unique 2nd ruckman. Assuming he remains fit, of course. Ben McEvoy is continuing his massive scoring tear, having topped the ton in his last three at an average of 122! If you picked him up for Sandi around that time, great call. Savage is fourth on the Makers list this week with a team, game and career high 164 points on the Gold Coast (which is why he’s not a little higher) on Saturday. He’s now a shade under 300k, starting at only a third of that price, and he still has a BE of -6! That’s a huge profit, and he, along with Shiels, would have to be one of the best picks of the year. Rounding out the list is the DT version of the prodigal son, the great Mick Barlow. In his first game back he collected an impressive 25 disposals on his way to 98 points. This was the top score in a team that was flogged by almost 90 points – a very good effort in any language. Unfortunately he is the most expensive player in the game at the moment, so he won’t be a viable option until very late in the year, but it’s a great comeback story nonetheless. A pretty good team, yeah? I mean, I’d be pretty happy to have a team that looks like that at this point of the year. Well, this week it would have posted a grand total of 846, including Boyd as captain! Crazy, because let’s be honest, these players are all very popular fantasy players. So that’s my Breakers. I don’t really want to dwell on it too much, because I own half that team (17 of them, actually). Knights (subbed – a little headache), N. Riewoldt and Broughton were all particularly bad, and Boyd had his lowest score of the year as a popular captain choice. It’s a huge relief that we get all our Pies back this week, even at the expense of some of our Sainters – and honestly, I can do without your combined 85 points Goddard and Riewoldt. Now, remember we still have 11 Rounds to go – keep those trades until you absolutely need them! You’ve been warned. 1 week ban, so soft. You need to upgrade Heppell and Lower or Poopy. Then I think you will have a solid line up. Then Upgrade Lower to Broughton maybe? He has a stinker this week but so did 9458 other players in the AFL. Then im sure you can work the rest out for your self? i was thinking of trading heppel to birchall or suckling or shaw?? trade hepell with finals bye or lower?? heppel has to go surely? Anybody else tempted by didak? 280K!!!! This time last year (ish) the pies went up a gear, and I think the bye was perfect timing for didak I feel. Here’s to a 100+ average from here. How do I select a picture for my profile? On a brighter note, Sweet Merciful Jesus is back in town!!!!!! is their any good down grades? Check out Chook’s Rooks on Wednesday. Yeah Bartel he is a cheap and nasty whore. Will drop down to K Hunts price by end of the season. What do you guys think about these trades? Are they any other guys I could trade in and are these the right guys to trade out? T Betta whats your rank? Nothing special – my team name is Tbetta Than You, you can see my team and rank there. By the looks of it Tbetta you have ample trades to move you up heading towards finals? What amount of trades do you think you should have now to be a chance for GF win within top 100 league?? does anyone know how long adcock is out for??? 15 of those breakers, including my captain. 0 of those makers. 1795. I got beaten by people with doughnuts! Was looking for advice on how to finish my team. Was tossing up whether Heppell is now the keeper which every1 thought he would be and whether or not I should look to get another premium defender. But is Sylvia a must get at his current price. Because I previously planned on getting bottomed out Sylvia dpping Petrie back to ruck and benching Zac Smith as cover, however, after hearing others say that they may even pick Smith up next year as a premium ruck and due to his high average over the last few games I’m not sure whether I should just play him as the 2nd ruck and not get Sylvia allowing me to upgrade a defender. So was thinking one of these two options and was looking for others opinions. Leaves me with 6 trades and Zac Smith on the field as a keeper. Also leaves me with 6 trades but Heppell or Lower on field as a keeper. I don’t think you’ll lose to much with Heppell or Lower as your on field keeper, Lower playing in the mids now is helping my decision in keeping him. Ditto! Loved being able to read it this morning when I woke up too… took away the pain of my ranking slide… FMDT. Depends on how you view Dahlhaus’ JS. Am I the only person trading Smith to Kreuuuuuuzzz this week? You talk about Didak like his lesser of a dreamer than sylvia, or fyfe. Maybe not this week as I still have Sandi. I noticed your scepticism about his return. Based on what exactly? However in 2 weeks i may have to pull the pin as well. This is the week to bring in Sylvia if ur considering it. I will be. Bartel will be very cheap in two weeks if you can wait unti then to finish your midfield. Anyone else looking at Heppell to Gram? At his best Gram can average 100 (2nd half of 2009), he reasonably looks like he’ll avearge 85-90 for the remainder of this year compared to Heppell’s 64 over the last 3 weeks, I’ll pocket $5k, and the DPP is maintained. Moreover, it means I won’t have Heppell warming the pine in round 24. I think you should do it. Heppell has that round 24 bye and he’s losing form fast while Gram is underpriced. You’ve just got to hope he can regain his early season form and also keep his spot as a couple of bad games could be the end of him. Thanks for the advice. Having spent far too long thinking about it, I don’t think I’ll do it. While Gram is capable of averaging 100, 85 seems like a far more likely scenario. If he averages 85, I may as well just take Otten/Stanley/Nicholson/Heppell’s 75-80 rather than burn a trade. I might be able to manage an upgrade to a Birchall, Fisher, or Shaw either this round or later in the year anyway, which would probably be a better option if possible. Obviously you would be picking Gram next week given the St Kilda bye … I would also dare say there are better options as Gram’s JS way be lacking given he hasn’t really re-established himself into the team. I agree, he has only just come back from being dropped and from what ive watched (which admittedly is not every minute he has played) his disposal efficiency has been pretty average. lucky kicks don’t have to be effective to get you 3 points or he would be scoring even less! Was going to do it this week to avoid Heppell’s next price drop since I can easily cover Heppell’s absence with Nicholson (and still have Jacobs as an Emergency). Either way, JS is the final nail in the coffin of this trade. Maybe if he proves he’s back to his old form in 2 weeks then I’ll think about it (although I’ll no longer pocket $5k). I’m wanting to get Sylvia in this week, however, it will mean I have Pav, Fyfe, Howe and Sylvia in my fwdline. I currently have Knights anyway so am faced with a donut in round 16 regardless. With 11 trades left, and going for overall, should I just get Sylvia at his price and just sideways trade one of the players with a bye in round 16? Is this a stupid strategy? If you’re going for overall you can’t have that doughnut, get Didak or Higgins instead. Even Chapman if you can gather up enough money. With Sylvia (as well as Pav & Fyfe’s) DPP status, surely you must be able to avoid the doughnut in round 16. Can’t avoid it with Mzungu as my DPP player in my mids, another bloody freo player!! I really can’t see a great target, already got Chappy. Only players I can think of are Higgins, Didak, Harvey, Goodes and O’Keefe, money isn’t really a big issue but I don’t want to blow it either. I’m not convinced Didak’s back yet (although I am a fan), and I’m holding off on Goodes until after his bye in 19.
tbetta had a piece of advice (refer below) on trading out Niewoldt for Cloke, which I’m almost certain I’ll do now that Buddy is out this week. Anyway, good luck with whatever you decide. ok, so you don’t like that idea. We shall see how it pans out. I need two upgrades in my backs. I am considering two Hawk chippers on the back line ala Suckling and Birchall, especially with the easy run home the hawks have during the finals. Worthwhile? Otherwise I would turn to Shaw. Also considering Harris to Daisy Thomas and Matera to Sylvia. How many players from Freo, Crows and Melb do u have in the fwdline? I am worried that carltons bye in rnd 23 since i have Scotland, Gibbs and is having carrots to much???? Too many Carlton players if wanting to be in a league GF…..
enjoyed the article .. nice work T.
Hoping to get some advice on my last mid upgrade. The other option is an upgrade to Mitchell using only one trade. I’m a huge, huge fan of Pendles, but in this case you should be smart and pull the trigger on Mitchell. He’ll average only slightly less, and you get that extra trade, which is worth more than ever at the moment. Personally, i have them both. Check out Dunny’s Get Off The Bench on Friday, he’ll have all the stats you need to make that call. Got a problem – Riewoldt and Buddy in fwd line – Bench can cover one. Still keeping Sandi and Selwood for now. Was going to trade in Pendles/Daisy for Selwood but need that on ice. Trade Roo for? Got 60K in the bank – is Cloke/Dawes a risky move?? A little unique and maybe could make or break.. Slyvia also in the mix, Brad Green after some ideas on what ppl think. Go Cloke! Be unique. At this stage of the season, a unique pick can have you rocketing up the rankings if they come good. His BE is right down, and Collingwood will start to turn it on big time from now on. Go for it! I know there’s an element of risk, and it is kind of sideways, but the more i think about it, Niewoldt to Cloke is an inspired piece of advice. What the hell, I’m taking it! Thanks tbetta…and good write up btw. Actually, even though I hate Collingwood, Leon Davis has 98 over his last 3 and before last year, was a premium fwd….. that would be a great unique pick! I’m thinking first option, leaves me with less bank but all playing fwds mids and def, just depends on whether it’s more important to have a fleshed out backline (who are inconsistant as all hell) or have more playing forwards (ditto) whether premium or not… surely didak will regain form? ?